It could well be also due to the heat, but the thought that come to mind over the summer holidays really don’t make us smile, and yet, we do see that there are chances of karting bringing out its old shine. But will these chances be taken? The coming of the summer holidays is always a bit “dangerous”; because it gives everyone time to think about the general situation of karting; past present and future. In fact, racing schedules have complete their “half way mark” and if we can’t talk about the season’s top events, it is because in September there are another two important events; events like the KZ World Cup in Sarno. However, also the fourth meeting of the Historic Master Go Kart in Pomposa, Italy, which besides being an occasion to see “old glories”, has now become an uncomfortable comparison because it “shows” everyone, new generation included, what karts were like up to about twenty years ago, simple, the bare minimum, more fun and easier to manage. But karting was also more selective, in simple words, more like “karting” should be! This is also the time for planning the future karting season, especially as far as regulations are concerned. We really don’t know yet what the 2013 season holds in store for us, but it seems that yet again instead of looking at problems straight in the eye, particularly those in KF classes, once again we are pretending that the fault falls on “details”, for example it depends on using one type of carburettor rather than another. This in itself isn’t a problem really, as burying our head in the sand and avoiding problems only makes KF sink further down, and it underline its uselessness more. The thing is that going along like this, also the good in it will go to waste, and it will delay the definition and introduction of a class with the right characteristics to draw and bewitch karters (something that the KF hasn’t been able to do). Besides risking wasting another three years, as we all know when it comes to tackling a problem, it is done in a situation of “emergency” and, of course, with all the usual problems that crop up with it. Another fantastic weekend for the third round of the 2012 Rotax Euro Challenge, making its first appearance in Sweden. Stormy weather made the battle for the four titles even closer. The Kartódromo Internacional do Algarve (KIA) will host the 13th edition of the Rotax Max Challenge Grand Finals on 24th November - 1st December. We travelled to Portimão on a hot day of August to have a look at the facilities and to get the first impressions of the track. Half way through the season the CIK/FIA presents new technical regulations for silencers: set limit is 108 dB, an innovative method of Phonometric acquisition positioned in the air over the straight and a penalization for “acoustic” transgressors. Anyone found guilty of this transgression could get up to 9 grid place penalty or get a 9 second penalty at the end of the race, while the “innocent” cross the finishing line at 16,000 revs … and almost in silence. Ben Barnicoat, the new KF2 star of international karting superbly supported by ART GP team (also at its debut season), has done pretty much what Julius Caesar, the ancient Rome dictator, did in one of his war campaigns throughout Europe: he came, he saw, he won. In his first full international season, also his debut season in KF2, the British talent is the outright new Caesar of European KF2 karting. But the win of the continental crown at PFI is only the beginning, as “the Caesar” is ready for new titles to conquer. Talking to Maxi Czyszek, a pretty kart driver from Poland chosen by you all as “Queen” of the competition “Miss Kart Girl 2012” by Quelli che il KZ. Maxi has told us some things about the lady-karter’s life, also mentioning some interesting opinion on the present situation concerning our favourite sport. Not even the heavy downpour stop the intense action-packed battles, as the best kart drivers in the region fight for the title in the Philippine round of the 2012 Asian Karting Open Championship at Carmona Racetrack. Rnd. 4 of the premiere Rotax series in the region, harsh fighting saw Senior drivers having a change at the front of championship standings. Great racing expected for the following round in Pekan. What is the best thing to do in summer when the environmental conditions become unbearable and we aren’t the only ones to suffer, our kart engines suffer too. Where else should one celebrate the 50th anniversary of the CIK/FIA if not at the Pista Azurro in Jesolo, Italy. CIK Vice President Kees van de Grint shares his thoughts on the highly anticipated event for vintage karts of the season. It’s that time of year when the first verdicts come out, and the response of the track is (almost) always right. We start with the most popular one-off event from the UK, the Kartmasters British Grand Prix, which boasted over 200 drivers on line up. 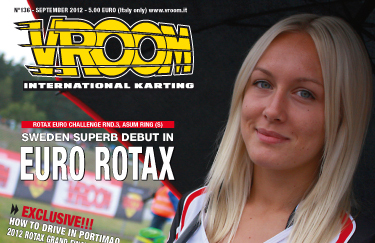 Germany was also a hot spot for the national Rotax drivers, just like Poland. Sweden was on fire thanks to the 190 drivers that gathered to contest the Swedish Championship/NEZ Championship. North America did its share too, with the USA Rotax Grand Nationals and the final round of the Eastern Canadian Karting Championship awarding the tickets for the 2012 Rotax Grand Finals. Following the controversy at the KF2 European Championship UK round, the CIK set the record straight communicating the decision by the MSA and awarding the title to Ben Barnicoat, with his ART GP teammate Charles Leclerc and Crg driver Felice Tiene completing the podium. Besides the superb event in Britain organized by TVKC, the English track announced technical novelties to help marshals. ART GP expansion carries on to include a new partner in Germany and Asia. SKUSA launched the 4th Street of Lancaster Grand Prix in California. The CIK U18 World Championship and Academy Trophy had the second round in Angerville, France: we provide you with a preview, while the full article will follow in Vroom October issue. Ending with October national and international racing calendar, which features 29 national events from 17 countries around the world, and a whopping 8 major international races.